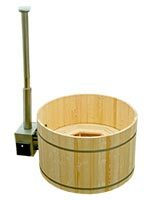 Northern Lights is a leader in manufacturing wood fired hot tub using the same 100% clear western red cedar we use in all our hot tubs. Wood burning hot tubs are popular amongst purists that claim the combination of a wood hot tub and a wood stove represents the ultimate in hot tub soaking experience. 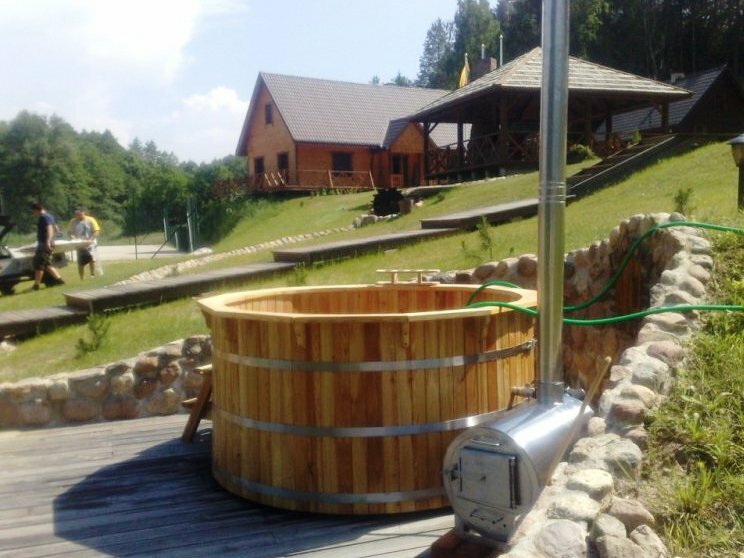 Most wood fired hot tubs are used in rural locations that have access to plenty of wood. This certain reduces the operational costs of using a hot tub. The wood burning hot tub uses no electricity and thus there is no forced circulation system found on our other jetted hot tubs. Instead the natural principal of thermosiphon is used. Thermosiphon is the physics that hot water rises. By using our Timberline wood fired hot tub heaters, the fire heats the water which slowly rises to the top port of the hot tub. At the same time cold water is drawn into the heater to be heated. This provides a natural convection that needs no pump. Use of a full insulated cover is possible. 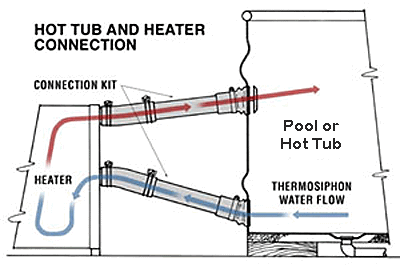 A hot tub loses nearly of its heat from the top as hot water rises. With an internal submersible heater it is impossible to use a fully insulated cover to retain the heat. With a full insulated cover you can leave the tub in the evening and in the morning the water temperature will still be warm enough to have a hot tub without restarting the fire. Chimney is not over the hot tub. 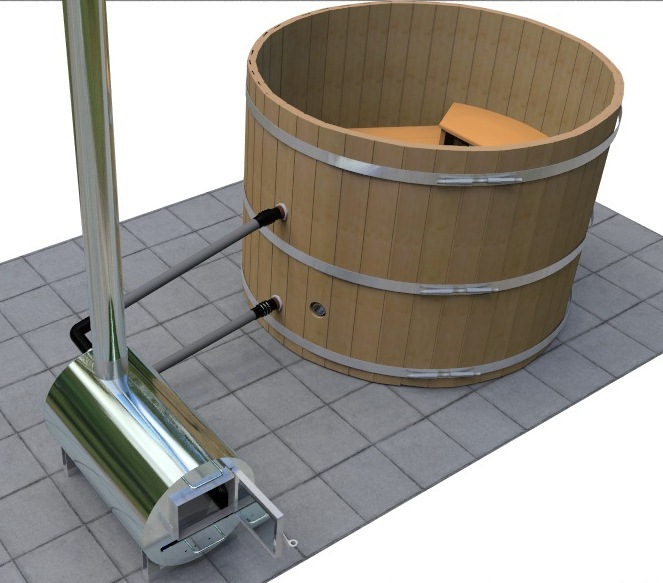 An external hot tub heater has the chimney away from the wood fired spa so there is no chance of contact with a hot chimney. 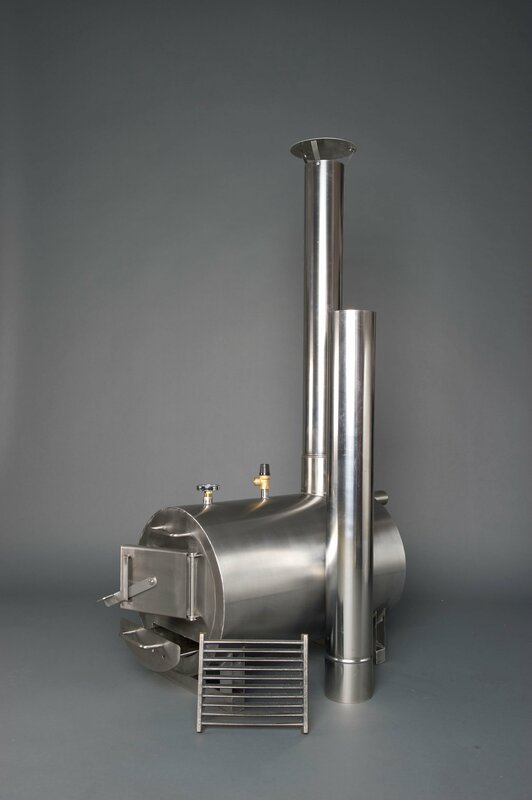 With an internal wood hot tub heater, the chimney is within inches of the bathers and there is more chance that smoke and sparks fall directly back to the bathers in the wood fired hot tub. Cleaning most internal heaters have a fencing system and a heater mounted to the floor. This makes cleaning the wood fired hot tub very difficult in the heater region. In some cases you need to fully disassemble protective fence to access the floor area that can often trap leaves, grass, and sand. Fueling hot tub from outside means less debris ends up in the hot tub! Loading wood directly over the hot tub water inevitably causes wood and ashes to land in the water requiring frequent cleaning. By controlling the fire away from the hot tub, there is no debris that ends up inside the wood burning hot tub. A wood fired hot tub is normally used differently than a regular electric or gas fired hot tub. 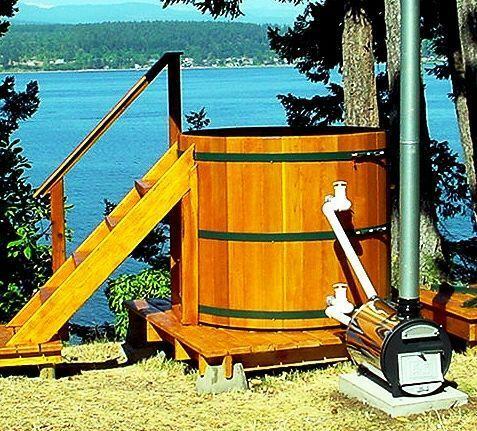 With a wood burning hot tub, the users typically fill the hot tub and use it a couple times then drain the water. With this type of short term use there is no need for chemicals which is a great advantage to those that want a pure chemical free hot tub experience. Like any wooden hot tub the exterior should be stained if the customer wishes to keep the rich cedar color. If left unstained the hot tub will eventually turn to a natural grey color. 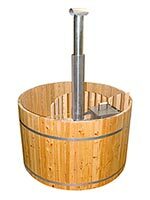 Our wood burning hot tubs also have the option of adding a pump filtering system with 4 jets. The optional upgrade is available in a 110-120 VAC power source that can plug into a home outlet that has a GFIC protected plug. With this option customers get the added use of hydrotherapy massage jets. The other reason customers often add this option is that it will filter the water. This means they can maintain the water clarity without having to frequently drain the tub. By adding a filter system a customer can reuse the water for months without having to drain it. If you are planning to use a wood fired hot tub in a vacation home or on weekends, you can expedite the hot tub experience with this option as you don't have to fill the hot tub on every visit! The essential difference (from a water-heating standpoint) is that a wood fired hot tub heater cannot keep your hot tub's water at an exact temperature, as the other heating options can. Moreover, the heat will tend to stratify, meaning the hotter water will rise to the top, while the cooler water will sink to the bottom. To combat this, use a paddle or similar implement to stir the water occasionally while you soak. 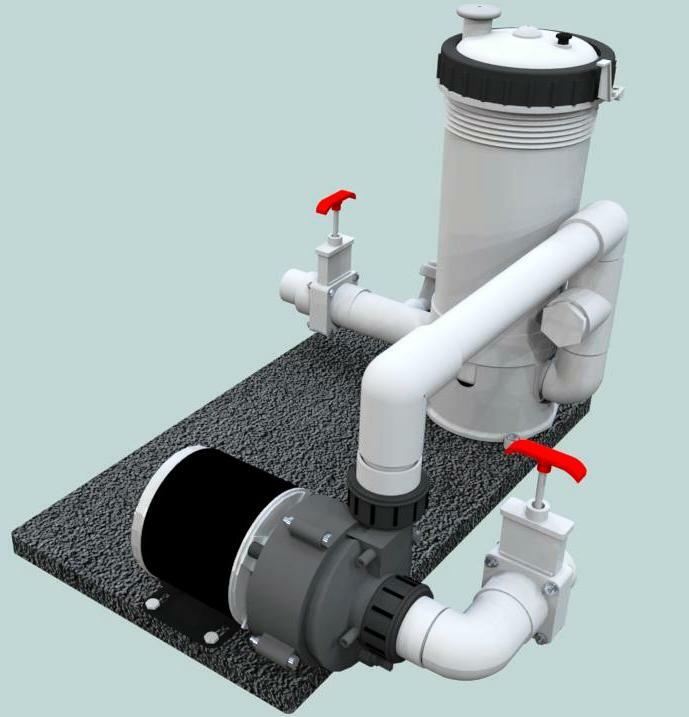 The optional Filer option will help reduce the stratification by force mixing the water. Controlling the temperature and heating times will depend on the type of wood, the water temperature, and external outdoor temperature. However by using the same type of wood a user will quickly get the feel for the right amount of wood quantity and the heating time required to reach the optimal water temperature. It is important to mix the water to get an accurate water temperature before you enjoy your hot tub as the top may be hot but the bottom is only luke warm.